Your smile precedes you in most situations, business and personal. beautifully symmetric teeth and gums help create an unforgettable impression, empowering you with the confidence that comes from knowing you're making a great impression. Don't let misshapen teeth and an unattractive gum line diminish your confidence. Modern dentistry provides you options that can help you create a powerful smile! If the horizon of your smile is jagged due to chips, slight crowding or cuspids that appear too long, enamel re contouring may be your best option. Enamel shaping modifies your teeth by gently contouring and smoothing the enamel to balance the elements of your smile. Dr. Kantarovich will carefully reshape your teeth and smooth any rough edges to give you a natural, more attractive smile. Because re contouring involves the enamel, local anesthetics aren't usually necessary for this procedure and the improvements are immediate and permanent! The result is a natural-looking, more youthful smile. Too much gum detracts from your beautiful teeth. Have you always admired people with a beautiful smile? Do your teeth appear to b e shorter than average? Is your gum line un even? Have your gums receded leaving large spaces between the teeth, exposing root surfaces? If any of these related concerns prevent you from having a perfect smile, Dr. Kantarovich may have a solution for you! If your teeth appear to be too short and you've always wanted a "toothy smile," gum lifting or reshaping may be the perfect solution for you! This procedure can generally be completed in one visit. Dr. Kantarovich will remove a small amount of your gum tissue and contour it to expose more of your teeth. Dr. Kantarovich may choose to use surgical instruments to complete the procedure. 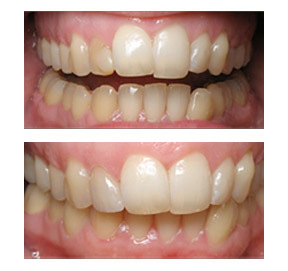 The results are instant and dramatic, showing more of the teeth and a fuller smile. If you are tired of seeing more of your gums than teeth when you smile, a consultation with Dr. Kantarovich will determine if gum lifting would improve your smile. If you have areas that show too much of the root surface or large spaces at the gum line, Dr. Kantarovich may recommend cosmetic gums. Cosmetic gums cover spaces with pink material designed to look like your natural gums. An impression is taken and sent to the laboratory for processing. the prosthetic gums are designed to fit snugly between your teeth and cover areas that have been exposed or receding gums. In some cases Dr. Kantarovich would recommend periodontal surgery. Subtle improvements in your smile make a world of difference, creating the confidence to direct life and achieve the goals you deserve. Dr. Kantarovich is your best resource to recommend cosmetic alternatives to improve your smile.